As expected, invites went out moments ago for Apple’s October 22nd keynote event. 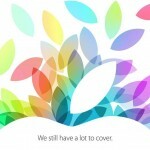 Reading, “We still have a lot to cover," what Apple is actually going to cover is a bit of a wildcard. I mean, new iPads are basically guaranteed, but there’s so much of Apple’s product lineup that’s badly in need of a refresh. Retina MacBook Pros, the Apple TV itself, and even iOS game controllers are all possible candidates for products that could see some face time on stage. As far as whether or not you’re going to be buying these products, we posted an article last week discussing possibilities with an incredibly vibrant comments section filled with people discussing what Apple needs to throw in the new iPads to get them to open their wallets. Be sure to give it a look, especially if you’re on the fence of buying.